So, this weekend was the New York Comic Con. I went twice, once for a friend's panel (more on that later) and again, mostly, to hear Bryan Lee O'Malley speak and get a signed copy of Scott Pilgrim vs. the Universe. I also wanted to get my copy of Scott Pilgrim & the Infinite Sadness signed, because that's my favorite book in the series. Also, there was a NYC-exclusive t-shirt that it turned out I needed. Mr. O'Malley was down-to-earth and friendly, reaching out to shake my hand and introducing himself after my stupid, stupid entry line ("Are you him? "), asking me where I was from originally ("T-t-t-texas," I stammered), drawing a wonderful Envy Adams sketch inside the front cover of Infinite Sadness, and even participating in the whole bartering section of our exchange. O'Malley, the author of the Scott Pilgrim books—duh—gave a terrific talk, and there were a few things that came up in his discussion that I thought really captured why this series is becoming so popular. Downright relevant, even. Like, New York Times article relevant. Unfortunately, it's late-late here in NYC, so I only really have time to talk about one interesting aspect of the books just now, but I'll run through the rest in another post or two to follow. And don't forget that this isn't my first time at the Scott Pilgrim rodeo. 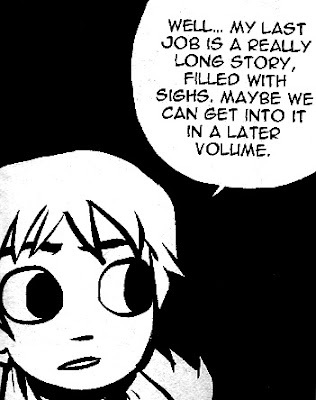 One of my favorite features of the Scott Pilgrim books is their awareness that they are comics. This is usually known as metapoetics in, um, poetry, but I haven't heard of a term for its use in comics. Metagraphicatics? I know. Ugh. Anyway, it's not that common a technique in something like Scott Pilgrim, a book that seems like pure fun before you really delve into it. But the inhabitants of Scott's world are pretty often aware they're in a comic book. Characters speak of time in terms of pages and volumes. In one wonderful scene, Scott's girlfriend, cornering him in a conversation about her age, asks why he hasn't just asked her how old she is. Scott, who spends most of the series in Utterly Clueless mode, responds with complete silence. You've probably seen how this is rendered in manga and Japanese video games: the long ellipsis. In this case, though, the last two dots of the ellipsis make up Scott's eyes. Usually artists deploying this technique are up to something Big and Serious. Not to say that Scott Pilgrim isn't, but it's not as...hmmm...overtly artsy a product as most of the works that display this tendency. So, in the introspective comic book The Fate of the Artist, for example, Eddie Campbell is looking (both within his head and without) at the status of comics art and his own role as an artist. Or you might think of the Metal Gear Solid games, like maybe the second one, which isn't so much a game that you play as it is a game that plays you. If you somehow never got the message, Hideo Kojima so badly wants you to know that he's got something super important to say, guys! Guys? Guuuuuyyyys! When I asked O'Malley in his panel where this feature of the books comes from, thinking that maybe he'd liked the way it was modeled in some other comic book or movie or whatever, he said that there wasn't any particular source. This is just one technique he really likes. Then he mentioned John Byrne's She-Hulk, which the panel's moderator took as his protesting too much, but I don't think that was the case. This is a feature I find interesting, too, wherever I happen to find it. Often, when a work knows what it is, you feel somehow closer to the author. Most of the time the book, for instance, stands between the author and the audience as kind of a screen, but somehow, when that fourth wall is broken and the book acknowledges it's a book, the three participants, book, author, and audience, momentarily find themselves in a closer, more honest sort of communication than usual. Of course, I feel a little strange saying that of a technique that's usually taken as kind of an arch gesture, but whatever. It's time for bed.